The Glitch Mob are an electronic power trio that hails from Los Angeles. However, they are more than just well known outside their home sphere, as the band has developed a shining reputation as a successful live act across the world. The Glitch Mob have built a massive following through their inventive light show and stage antics, and are now selling out large capacity venues across the nation. The thing that makes this particular group so fascinating is that unlike many of their laptop wielding contemporaries, these young synth lords actually perform all of their songs live, usually accompanied by intricate lighting rigs and beautiful Cirque Du Solei trained aerielists. 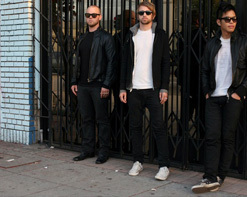 The Glitch Mob has also injected themselves into pop culture through having their songs featured in various video games, trailers for major films like the new Captain America movie and Tim Burton’s 9, as well as numerous television show trailers including FX’s Damages as well as the upcoming Sparticus commercial for Starz. Oh yeah, let’s not forget about the FIAT commercial currently airing across the world of which “Warrior Concerto” (one of the songs from their recent release – We Can Make The World Stop EP) is featured. On the fifth season of the NBC show America’s Got Talent, one of the contestants, a dance group known as “Fighting Gravity,” performed their act to music predominately provided by The Glitch Mob. The group made it to the final episode as runner’s up (a choice not well received by the public). The group’s 2010 debut album, Drink The Sea, debuted atop the iTunes Electronic Chart (as well as numerous other services across the world), where it has maintained within the top 10 best selling electronic albums since its release, popping in and out of the top spot every now and then. The album’s debut led to major press outlets such as The New York Times, The Los Angeles Times, San Francisco Chronicle, The G4 Network, a cover story for Electronic Musician, major features in the electronic music publications from XLR8R to Big Shot, plus urban outlets such as YRB and extreme sports publications such as Transworld, and numerous others to herald and support the band. Along with their new EP, The Mob were featured in news stories from NPR to WSJ and will be featured in a fall issue of Spin Magazine. Their remixes (check out their Daft Punk “Derezzed” remix, the first song on Disney’s Tron/Daft Punk remix album which hit #1 on the iTunes over-all charts) and songs, constantly land them the #1 spot atop Hype Machine’s “Most Popular” charts. “We Can Make The World Stop” is off the band’s new We Can Make The World Stop EP, which just hit online retailers and independent record stores across the world (yes, they press vinyl and support independent retailers). The band is currently on their US tour in support of the record on what is nearly a fully sold out tour! October and November finds them over-seas conquering Europe. “We Can Make The World Stop” is a mid tempo jam that features all the ear candy any electronic music lover will instantly adore, including blips, fuzz, piano, guitars, strings, and a strong driving beat. The group claims that this release contains some of their “most innovative work,” featuring each instrument completing the other. For example, the main riff in the song is first generated by an electric guitar, but then completed by a piano which evolves into strings! The video starts out with a young man being escorted into a house full of really tough looking characters. Your first thought might be – this man has really screwed up hasn’t he? However, it turns out the facility is a training ground for psychic warriors that not only fight with their fists, but also their mind, and the video showcases their induction process. This ceremony includes meditation that summons the power of ancient traditions and animal spirits, eventually allowing the leading character to perform telekinesis. We are extremely proud to bring you an independent group that has achieved major label level success on their own terms. The Glitch Mob are a brilliant example of how talent and effort can accomplish anything, and we hope you will join us in adding this clip to your coveted playlists. If you would like to interview the band or get your hands on a copy of We Can Make The World Stop for contests and giveaways, please get in touch right away. For more info, call Andy Gesner at 732-613-1779 or e-mail us at HIPVideo@aol.com. You can also www.TheGlitchMob.com to find out more about The Glitch Mob and tour dates near you.